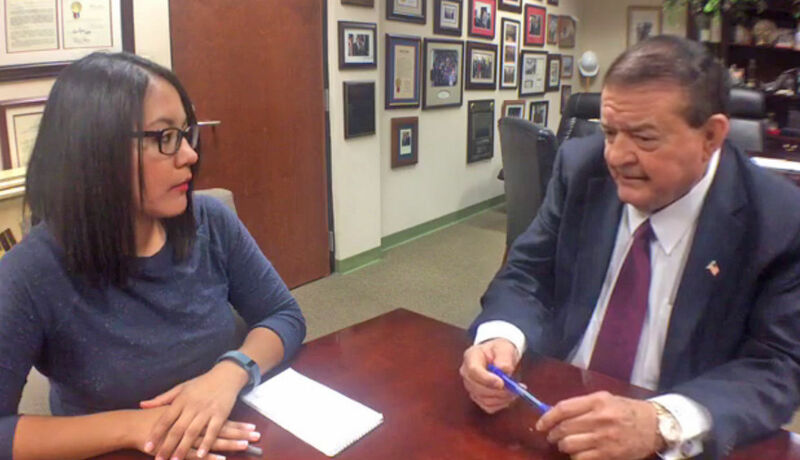 Mission Mayor Norberto "Beto" Salinas, right, is interviewed by Monitor reporter Berenice Garcia during "Monitor Live" event recently. MISSION — Mayor Norberto “Beto” Salinas said the practices authorized under Senate Bill 4, which allows local law enforcement to check the immigration status of anyone who’s been detained, have long been implemented here. The bill, which goes into effect on Sept. 1, was signed into law by Gov. Greg Abbott on Sunday and has prompted the American Civil Liberties Union to issue a warning to people traveling through Texas alerting them their constitutional rights could be violated via racial profiling and possibly illegal arrests. “That, we have been doing for the longest time,” said Salinas, explaining that anyone taken into custody by the Mission Police Department is asked about their immigration status. His comments were made during a discussion with The Monitor on Facebook Live Wednesday morning. U.S. Rep. Vicente Gonzalez, D-McAllen, released a statement Tuesday opposing the bill arguing it would place an undue burden on local law enforcement and would discourage people from reporting crimes. However, Salinas said current practices had not had that effect. During the discussion, Salinas also reiterated his stance that Hidalgo County commissioners allow taxpayers to vote on the construction of a new county courthouse. He also discussed his comments that were published in a Washington Post article last month in which he expressed support for a border wall. Salinas explained that residents who live along the border have reported problems with immigrants who cross through their land. He also pointed out that fencing already exists along portions of the border.